The music of composer, accordionist, and pianist Jeremiah McLane is a unique blend of Franco-American, Celtic, jazz, and roots influenced music. In 1980 Jeremiah started studying Celtic music and began playing the accordion, influenced largely by the Bothy Band and Dedanann. 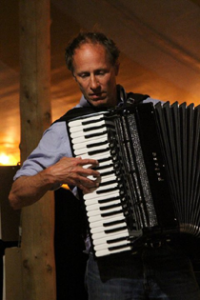 He studied with Chicago accordionist Jimmy Keane and Cape Breton pianist Doug McPhee. In the early 1990s he helped start two bands with strong traditional New England roots: The Clayfoot Strutters and Nightingale, both of which are active today. In 2003 he formed Le Bon Vent, a sextet specializing in Breton and French music. He has recorded nine CDs with these and other musicians.